It’s been 3 months since you’ve blogged! Where have you been?! It’s a valid question, in the blogging world, 3 months is an eternity! There have been lots of changes around here in the last 12 months. I’ve gone through a complete revamp and restructure of the business, all of which I am really excited to see come to fruition. For years I was generally a photographer, shooting whatever work came in the door. I was having fun, but slowly getting burned out. Photography went from being my passion to being my job and I was losing interest. A year ago I finished a coaching process to help build my business around what makes me happy. It was an incredible process of self-discovery. I learned that photography is my way to celebrate, and that being a wedding photographer brings for indulgent and sophisticated brides me much happiness as I get to be an intimate part of my clients wedding celebration. What I have been struggling with is admitting to myself that success looks different than it used to. I used to judge my success as a photographer based on the number of shoots I had each week, followed by the number of weddings on the weekends. Now that the only new photography projects I am taking on are wedding clients, I have much more free time during the week. I was frightened to admit that I am no longer a full-time photographer. I was feeling like my business was failing, and I wasn’t good enough. As a result I was completely withdrawn from putting energy into the photography business. I WAS feeling that way. Until this week. I haven’t been very open about what I do with my free time, and it has affected my ability to connect with photography. Last March I started a personal blog about my journey with Endometriosis and holistic healing called Rewired Life. This summer I decided to turn my blog into a book…which I am still actively working on. It is quite the project! In the middle of writing the book, this fall my Rewired Life blog went from a collection of personal stories to a website and advocacy for women with endometriosis. I decided that although it has been fun and therapeutic to share my story, I wanted to do more to help other women find ways to ease their pain. Now my time is split between networking, marketing, and working as a wedding photographer, as well as writing for Rewired Life. The previous decision to keep my work as a photographer separate from my healing work was not allowing me to be authentic. If photography is my celebrate…don’t you want to know what I am celebrating??! I am a 17 year chronic pain survivor, currently living symptom free of endometriosis….now that is something to celebrate! Cheers to health and wellbeing! My mantra is Love. Heal. Celebrate. 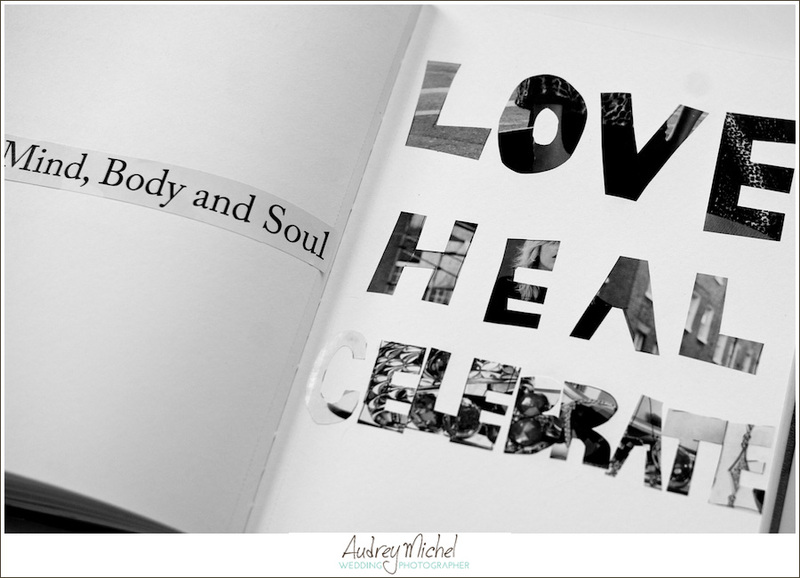 I am excited that I now spend my day helping women learn to love themselves and heal their body, and with photography I get to celebrate the beauty of life. Makes sense that my photography work is so emotional! I am very passionate about everything I do, and now I have two businesses that fulfill the why of me. It’s not work, it’s Life Work. 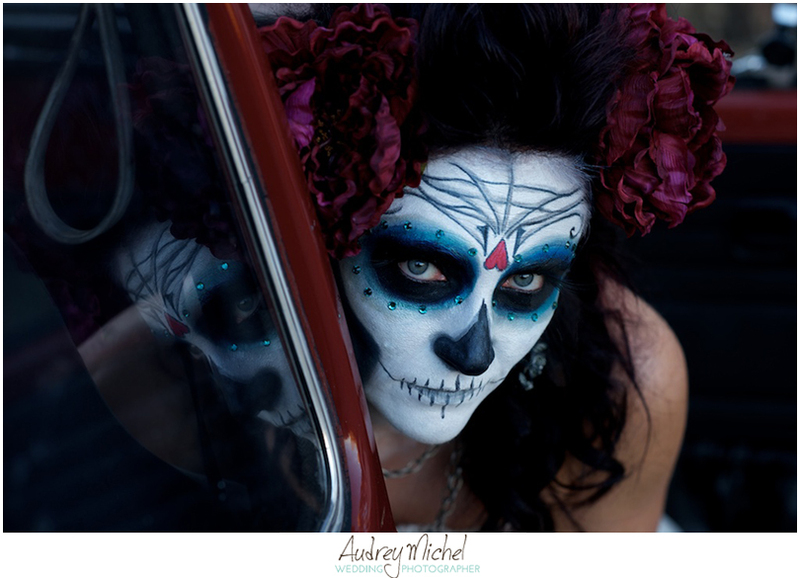 I’ve been having fun lately posting images from my “play time” as a photographer, and I thought Halloween would be the perfect time to showcase the work of Kori Schell of AK Studio. Kori is always up to something creative and fun, and I love answering her phone calls. 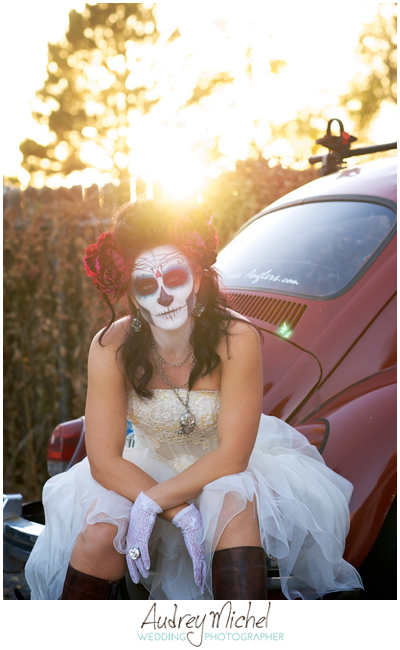 Our conversations go something like… Hey, I’m painting Sugar Skull faces, want to shoot it? Rarely do I completely understand what she is up to, but it doesn’t matter, it is always a blast to capture Kori’s creative energy. Being involved in artistic projects inspires me. I love exploring with my camera. We had a great evening! It is so fun to spend time with creative people, we vibed off each other’s energy. As the shoot went on the light just kept getting better. So beautiful! I could have shot for hours! This summer I had the honor of photographing one of my best friend’s weddings. Always such an honor to be an integral part of a wedding day. Julie has always said, “When I get married, you have to be my photographer.” OK! And then this spring…the ring went on her finger, and I got the message, “You have to have September 28th open!” Sure enough, I did. Let the journey begin! Prior to any wedding day, I like to participate in the planner or coordinator’s final walk through. It is a great opportunity to get everyone on the same page. Walk throughs help me understand unique logistics and intricate details of the day, which in turn helps me organize photos throughout the day. I smiled and said, “Ask me what I enjoy.” She did. I told her when given the choice, I would rather be a photographer at a wedding over being a guest. I get to see your day in a way no one else does. I get to be with you all day; not just watch from afar, hoping to talk to you for a couple of minutes. It felt really great to see my best friend exhale. She thought she was making me work when I am supposed to be celebrating. Being a wedding photographer is not work, or is it a job. For me, being an integral part of a wedding day IS my way to CELEBRATE. These are the moments that only I get to see, moments that bring me happiness. I believe if I wasn’t there to capture it, no one else would get to see it either. As I sit here editing Julie’s wedding, these are the moments I felt most privileged to witness and now, share. I’ve said it before, that one of my favorite moments of the day is the first photograph of the bride. Every bride glows on her wedding day. In this moment captured above, I believe I said something like, “Honey, you are getting married today!” Julie exhaled, and gave me this smile. It will forever be burned into my mind, just how beautiful my friend was on her wedding day. There are so many images of Julie and Seth that I love. This one in particular seems to describe them best, to me anyway. I can hear Julie’s laugh as she looks at her almost husband. The last few moments with Dad and his little girl is one I will always cherish. I love watching the dynamics. Sometimes the moment is too emotional and they won’t look at each other, and other times I get really sweet glances…like I did Julie and her father. Julie, thank you for allowing me to be your photographer, and giving me the gift of witnessing such intimate moments of your day. You are beautiful inside and out. Congratulations to you and Seth! I believe in honoring the energy and spirit within art and objects. What does that mean? My education is Bachelor’s of Science in Design with a minor in Art History, and it is where my appreciation of artistry and attention to detail began. One of a kind objects, born of someone’s creativity and imagination makes my heart sing! I can FEEL the artists’ spirit spilling out of the object. There are a few things I’ve held onto from my days as a designer, and photographing events for Luxe Interiors and Design Magazine is one of them. I love the opportunity to see my old design friends, which is always fun to catch up. And, I get to be an integral part of amazing events. Luxe Magazine draws very design oriented, sophisticated clientele, and always finds the most unique event locations. 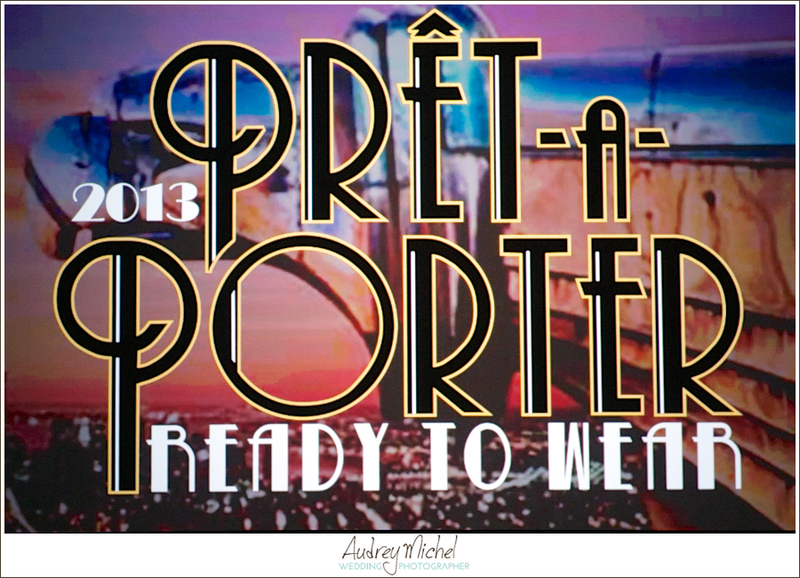 Recently I had the opprotunity to provide press coverage for the International Interior Design Association’s (IIDA) event Pret-a-Porte. This is a Ready to Wear fashion event where designers are tasked with designing and creating a couture fashion piece, and wearing the outfit down the runway. Designers are paired with interior material companies and must use the assigned construction materials for the entire outfit. Assigned materials could include flooring such as carpet, hardwoods, or tile, even lighting or office workstation materials. Then, each team must take inspiration from the Roaring ’20’s. I wanted to write about this event because I was SO VERY impressed by the creativity and artistry of the designers, and by the attention to detail. How impressive of a dress could you really create from carpet or countertop laminate? These designers deconstructed materials and utilized every last ounce of available components. Instead of simply cutting carpet for a skirt, one team used uncut carpet fibers as a fringe detail. Brilliant! This design team from Aquilano Leslie and Capco Tile took the show’s 1920’s inspiration to heart. 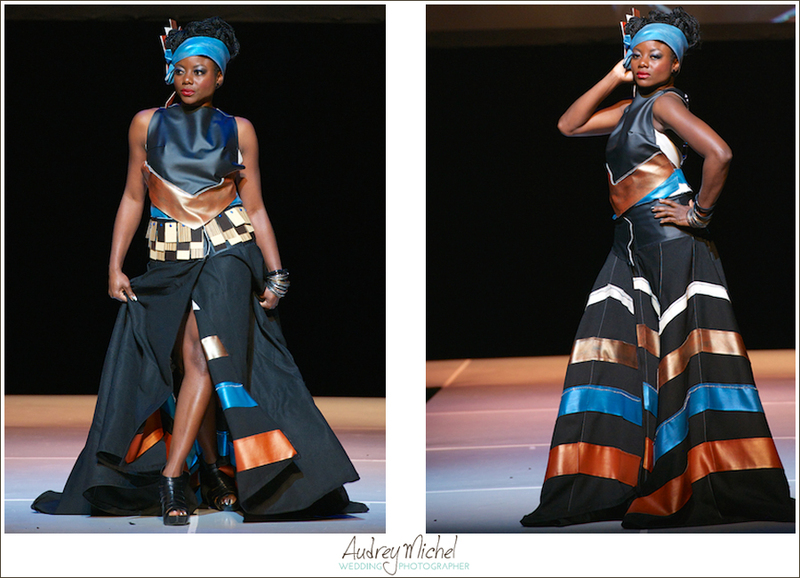 Utilizing mosaic tiles, they created a flapper inspired dress and accessories. Let me say that again, they created this dress with hand glued, individual mosaic wall TILE! This design won Best in Show. As these two girls showed off their team’s designs, ideas, and creativity, you could feel their team’s energy and spirit strut down the runway. It was awe inspiring to be a part of such an artistic and fun evening! As I flipped through your wedding, making final edits and preparing to deliver your images, this photograph got me all teary eyed. I sat back, and thought about the day we met, almost a year ago, the day you ultimately chose to hire me for your wedding. I cried that day too. 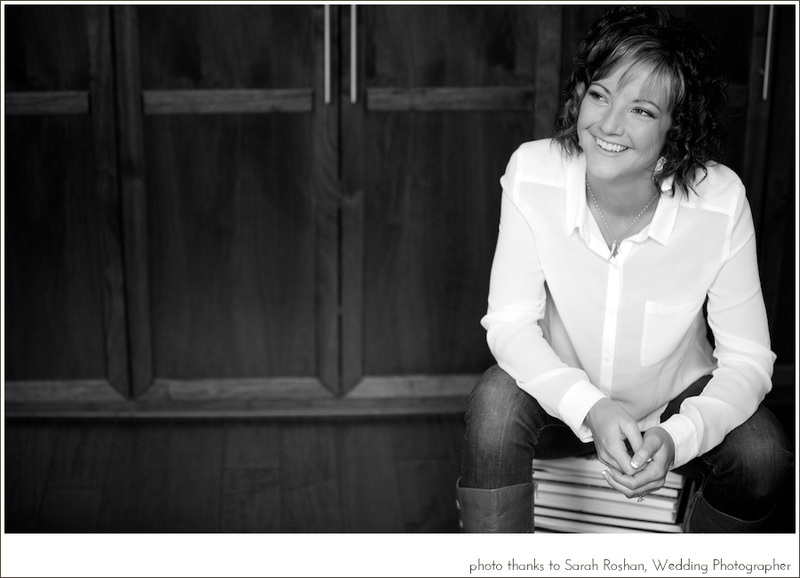 You didn’t know it, but at the time I was revamping my business. I had hired a business coach with the premise of discovering why I love photography, and designing my business accordingly. As you talked about your dislike of a recent photograph of yourself, and how you wanted nothing more than look back at images from your day and feel beautiful, I felt so connected to you. We both teared up. In that moment I discovered exactly why I love being a wedding photographer. I LOVE helping women feel beautiful. I believe every bride glows on her wedding day, and nothing makes me happier than to capture that glow for her to share with loved ones for a lifetime. It makes me happy, because I get to feel beautiful right along with her. I wanted to say thank you for being so vulnerable and sharing your fears. Your courage helped me rediscover my love of photography, define my passion, and find the words to communicate my passion with others. This is the image that made me cry. 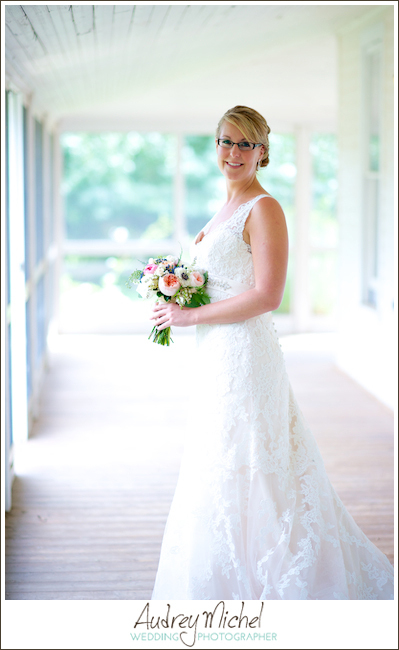 The first few moments of a bride in her wedding gown are always my favorite. 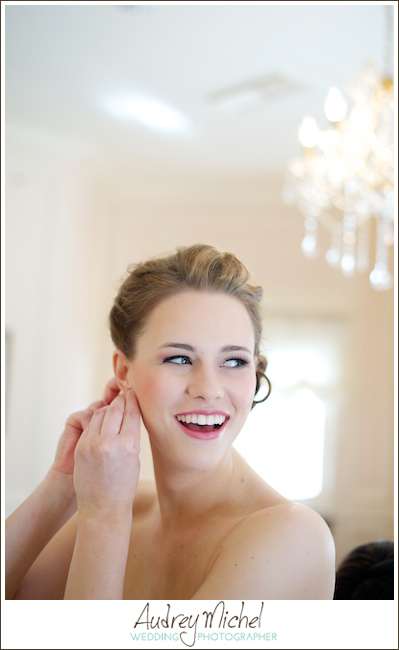 The “oh, my, I’m a bride” smile washes over her face. The deep, authentic smile that is hard to get rid of, overwhelms her body. And you can feel her joy. If you are looking for a decadent and indulgent wedding cake, beautifully designed with modern elements and attention to detail… Rachael Teufel with Intricate Icings is your girl. Rachael has been a Food Network Competitor 3 times, taking second place twice, and winning her final episode. Rachael also teaches online cake design classes for Craftsy.com. What I love about Rachael, and where her and I have connected, is her absolute passion for modern design, and intense attention to detail. Earlier this summer I had the honor of spending some time at the Intricate Icings studio photographing some of their favorite cakes, and watching the team create masterpieces. The cakes I gravitated to were inspired by designer wedding dresses. What a fabulous way to keep all the design elements of a wedding day cohesive! 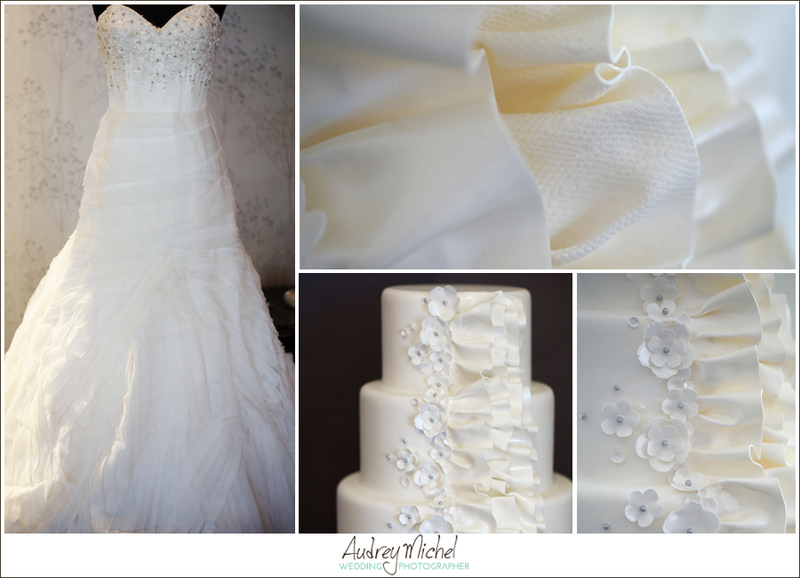 This cake is designed after Liancarlo dress style 5826. What attracted me to this cake, is the textures. The cake body is matte, and the floral details and ribbon are a variety of textures. The contrasts make each element stand alone. What impressed me the most is the ribbon detailing. First, let me say, everything on Intricate Icings cakes is edible. The details Rachael and her team are capable of doing with sugar and icing is incredible. Every level of ribbon have different textures, matte, tulle, and silk. This detailing is taken directly from the French tulle and silk organza textured skirt designed by Liancarlo. Stunning! The second cake is modeled after Liancarlo dress style 5844. I LOVE the French Lyon lace on tulle design! 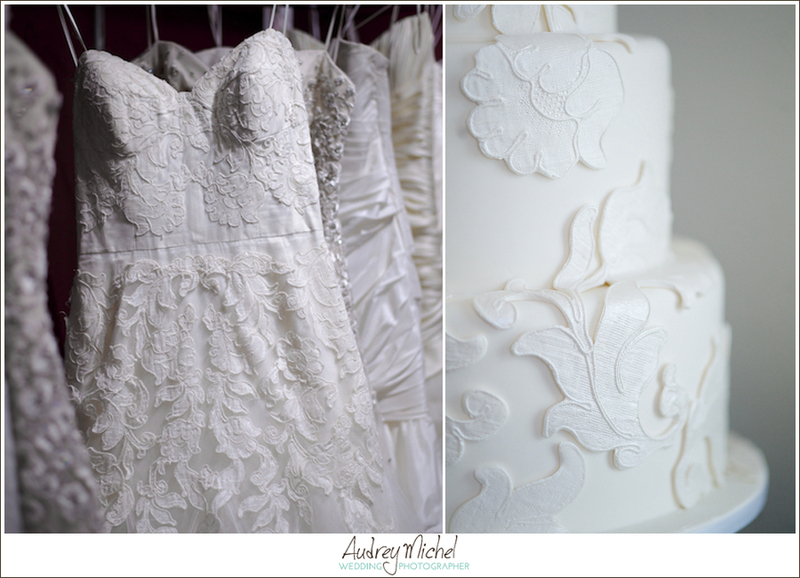 In both the dress and the cake, lace is the dominate design element. Check out the detail shot, I had to physically get this close to the cake to decide if there was a lace overlay or not. But again, Rachael assures me the cake was created entirely with sugar! Similar to the lace elements on the dress, the lace on the cake is slightly raised as well. I was continuously impressed with the artistry and commitment to design integrity. I have one more thing to say about Intricate Icings… their cake flavors and fillings are unique and amazing! My personal favorite is the Zucchini with lime zest, a refreshing and moist cake. It pairs beautifully with cream cheese filling layered with diced fresh fruit: strawberries, mango, kiwi, and mandarin oranges. Is your mouth watering yet? Intricate Icings makes their own modeling chocolate used for decor pieces like lace and ruffles. Here is where it gets good… The fondant used is made from white chocolate which simply melts in your mouth, unlike any other fondants. I LOVE white chocolate!!! Wedding photographers and other wedding vendors quickly become cake snobs. Eating wedding cake is a wonderful perk, but when it’s every weekend, you start to spend your cake calories wisely. I will never refuse cake from Intricate Icings! special thank you to Rachael Teufel of Intricate Icings, and Cate Malone and her team at Little White Dress. On your wedding day, when things go by so fast, your loved ones gather, and many of whom you will get to talk to for only a second. In the precious, fleeting moments that create your day, as your wedding photographer, it is my mission to see everything. I see your day in slow motion. Think of a professional baseball player, and how they can “slow down” pitches, and actually see the spiraling stitches of the baseball. That is how I feel on a wedding day. Everything is in slow motion. I am sensitive to the emotions in the atmosphere, and I can feel where to be to capture that slit second. A split second, that as an anxious, excited bride and groom, you may not notice. I can feel the emotion welling up in your mother’s eyes as her husband dances with his little girl. I know exactly where she stands, and I know what angle makes dabbing tears look beautiful. I know Grandpa really wants to photograph his first Granddaughter during the initial moments in her wedding dress. The light wraps around her face beautifully, and she is glowing. It’s cool, I can share. Because sometimes TAKING the picture brings him joy and happiness. And, I know that moment, right when a bride puts in her last earring, and catches a glimpse of herself in the mirror, it really sinks in, that today, I marry my best friend, and the love of my life. I am not just a person with a camera. 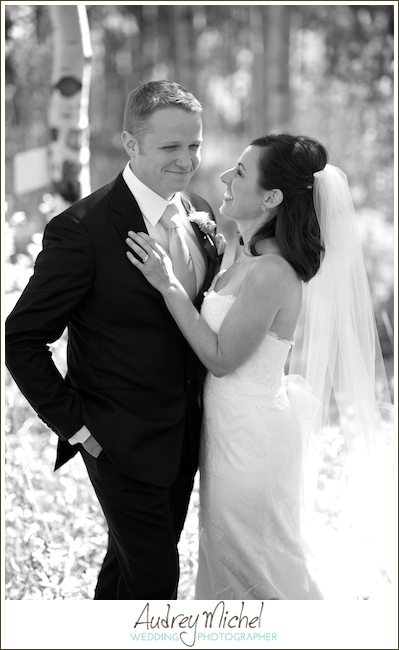 I am a creative, sentimental wedding photographer, reflecting love and celebration. I am captivated by every minute of a wedding. Joy and love is what I see in the world and through my lens, and is what I share with my clients. The experience of sharing wedding photos, and reminiscing with friends and family should be filled with laughter and love. It is my passion to understand my clients and capture their love story. What I do, can’t be taught, or learned by reading countless how-to blogs. I radiate happiness, love and joy, and bring a calming presence to a day filled with emotions, anxiety, and excitement. I believe every bride glows on her wedding day. My happiness comes from helping a bride feel beautiful, and capturing that feeling for her to share with her loved ones for a lifetime. This weekend, August 15-18th, Little White Dress has then entire Liancarlo collection. 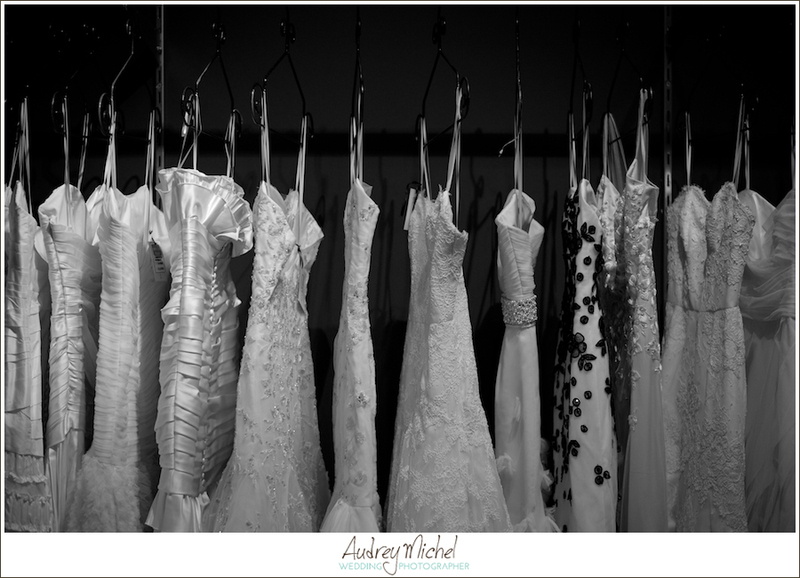 I had the privilege of previewing the collection yesterday, and every dress is absolutely STUNNING!! Here is a little sneak peek!! Here is more information from Little White Dress, and a feature on COUTURE Colorado blog. Take a look at Liancarlo’s design process, start to finish. As well as what inspired his new Venetian Light collection. 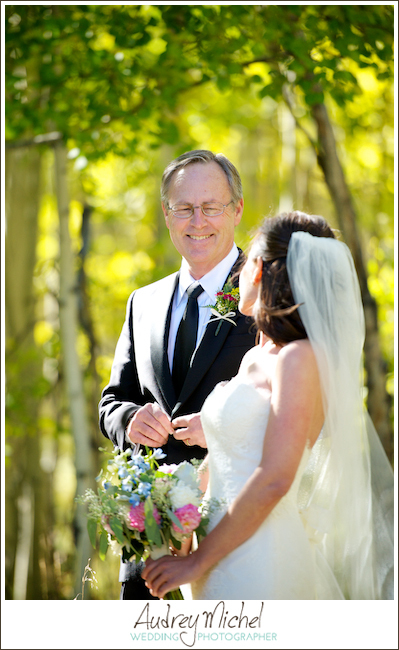 I am thrilled to announce COUTURE Colorado featured Laura and Collin’s beautiful wedding day on their blog this week! 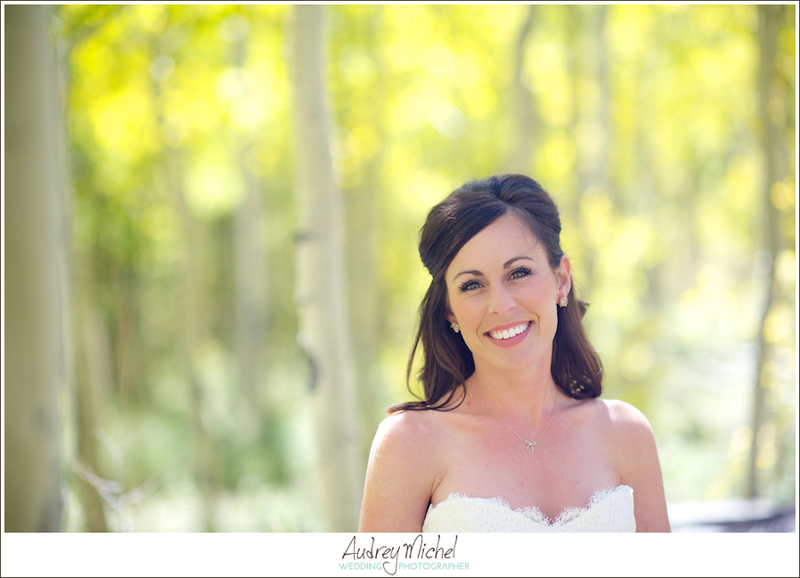 Check out COUTURE Colorado’s post, as well as my take on their wedding day. There is something about the mountain air that brings my blood pressure down, it is so relaxing!! 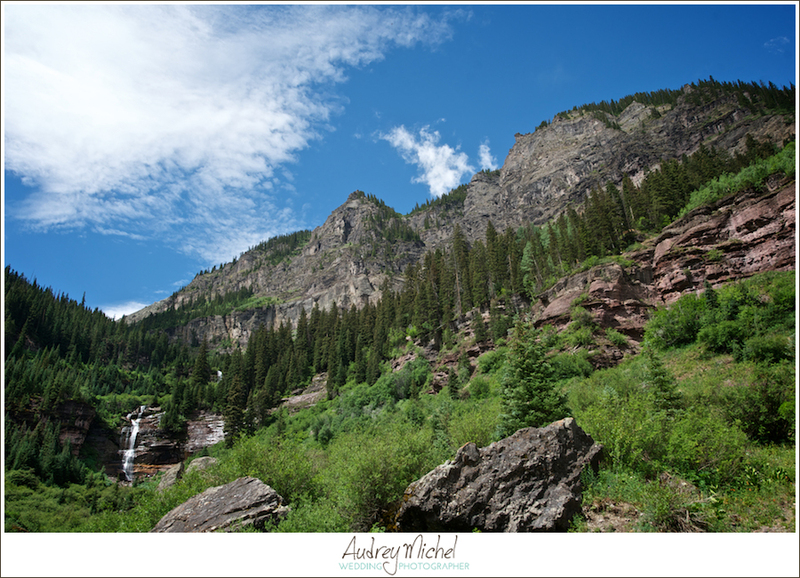 Aaron and I spent last weekend hiking and hanging out in Telluride. SO BEAUTIFUL! Everywhere you look are stunning views. As a Denver girl, I spend a lot of time in the Front Range and Summit County, which I love. I honestly thought all of the Rocky Mountains looked similar. The San Juan range in southwest Colorado are much steeper, coupled with mesas, bluffs, and cliffs. So different, and beautiful in their own way. What I appreciated most about Telluride, beyond the breathtaking views, is the town’s intense intent on maintaining the integrity of the town’s look and feel. 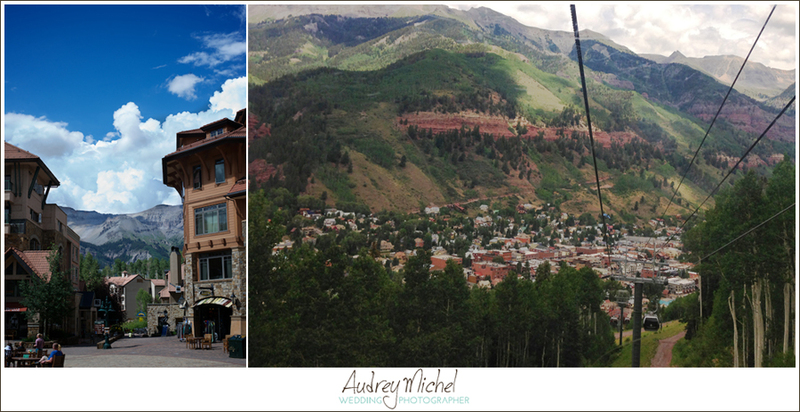 In 1964 the core town of Telluride was put on the National Historic Landmark District registry. An honor the town takes very seriously. Their architecture, traditional design, open space, and small mountain town feel are all very much intact. The valley floor open space as you approach Telluride will always remain, leaving little room for expansion, and therefore limiting real estate for a fortunate few. The town has done a great job to maintain their small scale, everything is walkable, and pedestrian friendly. I think the best decision to keep cars out, is the free gondola connecting Telluride to Mountain Village (at the top of Telluride Ski Resort). The Green Gondola Project transports the public between the two towns saving an average of 2 million cars a year from driving the 8 mile trip, and cuts travel time to a matter of minutes. And of course the ride is stunning! Aaron and I had an awesome time! And of course, cannot wait to get back. Also, a big thank you to Hotel Madeline for hosting us! more about our trip can be found on my personal blog Rewired Life.